Listen to this new podcast from Ron and Robert on Divorce – you’ll be glad you did. Missed the first four parts of this series? Find them here, here, here, and here. Don’t miss another one! 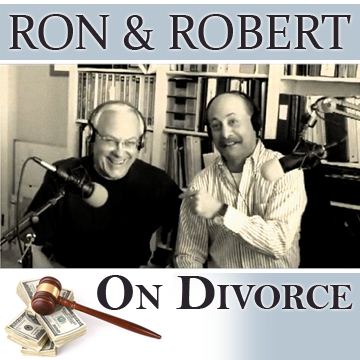 Subscribe to Ron and Robert on Divorce on iTunes and get free podcasts every week. After much consideration, we have decided to try a new approach to the Second Saturday Divorce Workshop. We’re still offering tools, strategies, and information from three top divorce professionals, but the program is more compact and more affordable. Join us Saturday, October 8, 2011 from 10:00 a.m. to 12:00 p.m. at our office in Woodland Hills for a comprehensive workshop about the divorce process. 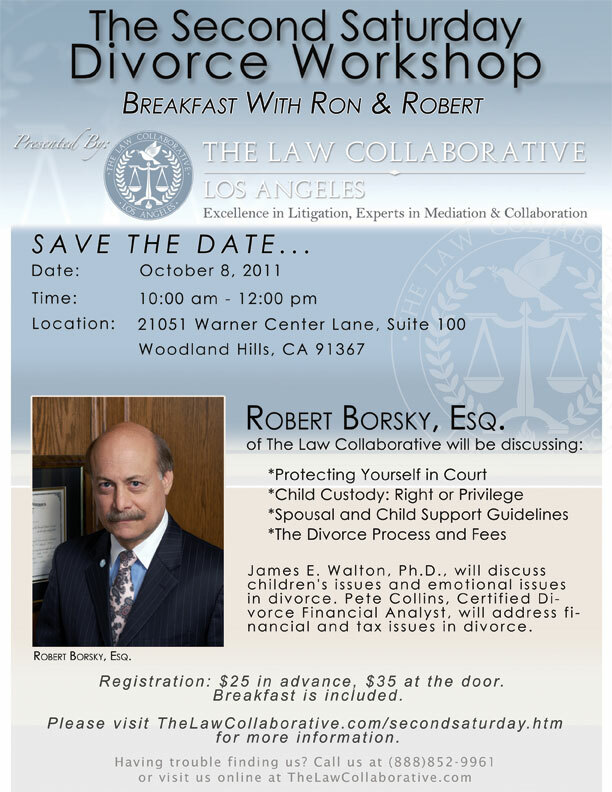 Robert Borsky, Esquire, of The Law Collaborative will speak about the legal divorce, Pete Collins, Certified Divorce Financial Analyst, will discuss important financial and tax issues that most people don’t know about, and James E. Walton, PhD will cover emotional agendas, how to help the kids, and how to deal with your ex. Breakfast is included. The new rate for our two-hour Second Saturday Divorce Workshop is $25 in advance, $35 at the door. For more information or to register online now please visit www.thelawcollaborative.com/secondsaturday.htm or call us toll free at (888) 852-9961. Here are some tips and suggestions to help make the process of divorce a little bit easier. If you follow these suggestions, you will save yourself a lot of potential frustration down the road. 1. Always take your file with you everywhere. 2. Keep a journal. Write down every significant event, conversation, discussion and action of your spouse at the time it occurs. 3. Keep a ledger. Write down every financial aspect of your case to assure a complete, accurate, and legible record of all the financial aspects of your case. 4. Memorialize every agreement with every person who is interested/involved in your case. Keep/send copies. 5. 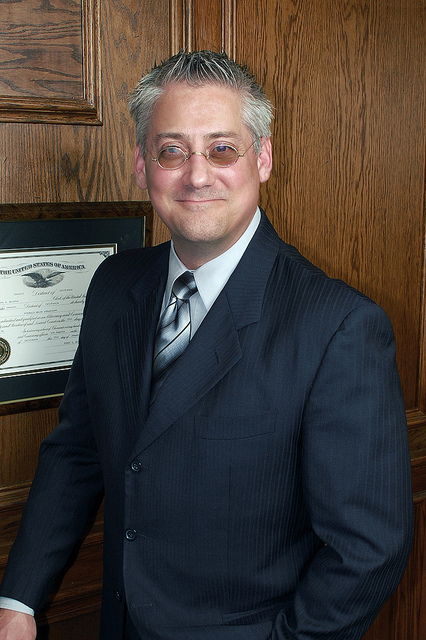 Meet with your attorney in person to design strategies for your case. Explore consensual dispute resolution; confirm everything in writing. 6. Know your strategy; do not deviate without advice and counsel. 7. Participate in the preparation of your case; draft, document, investigate, gather information and pre-interview all witnesses. 8. Let your attorney know when s/he is on track or off. 9. Schedule regular spit and grouse sessions with your attorney. DO NOT let resentments accumulate. 10. Keep your account current at all times and offer security if you fall behind. Missed the first three parts of this series? Find them here, here, and here. This article by J. Richard Kulerski, a Chicago based divorce lawyer, is brilliant. What he says in this article we’ve been saying for years. Hallelujah, Mr. Kulerski. The public is displeased with the divorce legal system, and sees it as too complicated, lengthy, and costly. The argument is that the system should satisfy society’s needs, not frustrate them. Heck, many soon-to-be exes are now spending more on their divorce than they did on their wedding. We need to change how we divorce, but the problem lies in figuring out what to change it to. 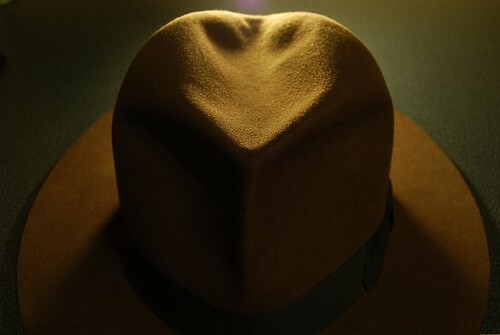 This is not as impossible as it sounds, but it does require our doing the last thing on earth that we want to do: treat our soon-to-be ex and their settlement position with respect and understanding. This does not mean being weak; it means being smart. Listening to their side of the story is the cheapest concession we can make. This is the civilized approach to divorce. It calls for us to behave at our best, at a time in our lives when we are inclined to act at our worst. Up to now, we have felt entitled to act at our worst, and the result has been disastrous. You have filed for divorce and told your attorney “I want everything I can get from her/him.” Really? Do you think it is that easy? 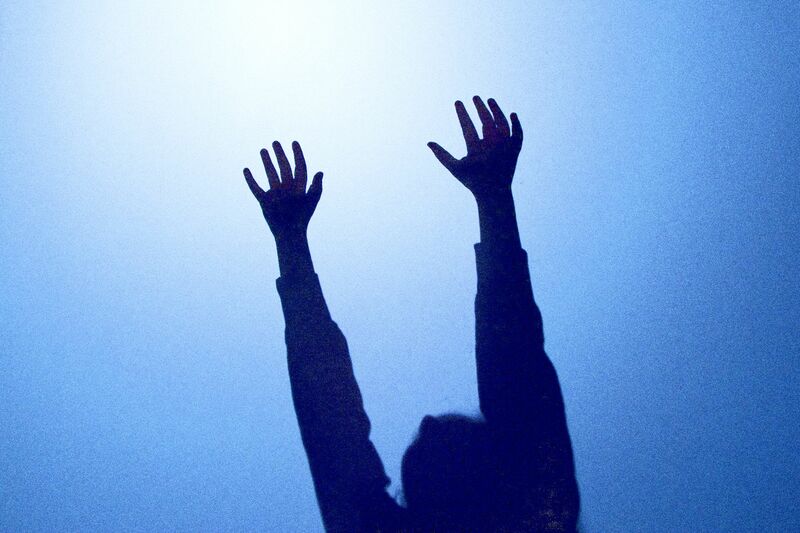 What happens to you if ‘everything’ isn’t enough? How are you going to live? Do you have a job that pays enough to support you and/or the kids? Do you even have a job? Have you given any of this the least bit of thought? Tough questions, but questions you must answer. A Dirty Word Or A Saving Grace? I regularly help couples design and build foundations for the most important project in their lives. The work is long and involved and at times unpleasant, but I believe the results are worth it in the long run. We take the time to examine and investigate their dreams and circumstances, and using that information, we design and create a strong foundation together which will support whatever they chose to build on it. If what they build together fails sometime in the future, it will not be for lack of planning. No, I’m not a contractor or an architect. I’m a family law attorney and the “foundation” I’m describing is a mediated premarital agreement. “Premarital Agreement” and “Pre-Nup” are dirty words in the common vernacular, but I believe this is due to misunderstandings based on Hollywood propaganda and sensationalistic news coverage. Premarital agreements need not be unilateral documents forced by one spouse upon another. The alternative to the Hollywood stereotype, and the vast majority of the premarital agreements we draft in our office, is a premarital agreement reached by mutual discussions and assent to terms designed to support marriage and discourage divorce. At the most basic level, people get divorced because they’re “unhappy.” Unfortunately, statistics tell us that divorce does not bring happiness. Studies reveal that most people are just as unhappy after their divorce as they were before it. But in addition to being “unhappy”, after divorce they’re also damaged; emotionally, spiritually, and financially. Joseph Nowinski, PhD, has written a compelling article for the Huffington Post about whether or not co-parenting is actually in the child’s best interests. This is something I think about whenever I hear fathers of breastfeeding infants demand equal parenting time. While I appreciate the desire to be an integral part of your child’s life, I can’t help but wonder how the father plans to breastfeed his infant during his custodial time. My personal bias is to try to roughly match initial visiting and custody arrangements with each parent’s level of parenting experience. For example, if reality shows that one parent has had 75 percent of the parenting experience described in the above questionnaire, while the other has had only 25 percent, after the divorce children should divide their time between the parents in roughly the same proportions, at least initially. Such an arrangement can easily be written into a divorce agreement, which might place a time limit on the 75/25 split. Over time the less experienced parent should be given opportunities to “catch up” in the day-to-day parenting; for example, by taking the child or children to pediatrician appointments, by cooking family meals, and by supervising bedtime preparation. Then, as the less experienced parent begins to catch up, living schedules can gradually move toward a true fifty-fifty split. This gradual increase avoids making the child or children anxious and avoids having to separate a great deal from the parent who early had done most of the parenting. What do you think? Would co-parenting work in your family? Have you tried it and had success? Or have you tried it and discovered that it’s not all its cracked up to be? Read the rest of the article here and share your opinion – we want to know what you think. Pssst: Tomorrow is the last day to RSVP for our complimentary retirement seminar, Retirement Illusions: Where do we go from here? Click here to RSVP now! Description: Attorney Pourya Keshavarzi and Irene Smith, MBA, CPA, CFP®, CDFA™ of Smith Financial Management, offer a wealth of knowledge in this short seminar. Laypeople, new attorneys, and seasoned attorneys alike will learn important tips, tricks, and strategies for moving cases forward, how to better protect the assets during divorce, why fighting for to keep the family residence may hurt you or your client in the long run, and common divorce-related tax issues most family law attorneys don’t appreciate or understand. Refreshments served. Description: Attorney Ty Supancic provides an interactive and informative presentation encompassing all aspects of family law from pre-marriage to parenting, divorce prevention, reconciliation, and family reorganization. Anybody contemplating marriage, children, or divorce, and those seeking a general overview of how the law relates to families, are invited to attend. This intensive overview of California family law and how it relates to families and personal relationships is ideal for attorneys interested in adding family law services to their practice. Key topics covered include prenuptial agreements, fiduciary relationships, spousal tort liabilities, support guidelines, and property division. Refreshments served. Description: Ron Supancic, Certified Family Law Specialist, Court Panel Mediator, Coach, and Collaborative Family Lawyer, shares the best kept secrets in family law. 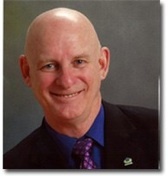 With forty years of family law experience under his belt, Ron is in the unique position to offer information most divorce lawyers won’t give you. Discover the 5 Pillars of Marital Success, learn about the 7 Options for Divorce, find out about the pre-marital agreement the state of California wrote for you, and much more. This incredible presentation will arm you with the knowledge and power you need to protect yourself, your family, and your assets during divorce. Additionally, this seminar is ideal for lawyers who are seeking to expand their family law practice and are struggling in a weak economy. The emphasis is on showing lawyers how to (1) explain, (2) teach, (3) incorporate, and (4) practice unbundled family law, congruent with the California Professional Code and the Rules of Professional Conduct. Ethical issues are discussed in detail as well as techniques and tactics for enrolling parties and counsel in a revolutionary approach to conflict management and dispute resolution. Refreshments served. Seating is limited, so be sure to register now. We look forward to seeing you soon! To register for any of our upcoming events, please visit www.thelawcollaborative.com/events.htm or call us toll free at (888) 852-9961. As long as avoiding pain is more important to you than being loving to yourself and your partner, you will be closed and protected and the conflict cannot reach a mutually satisfying resolution. This page took 0.543 seconds of computer labor to produce.